I've attached a photo that kind of shows the box. I bought it at Lowes and it's a plastic tool box that's big enough to hold my jack and tools. They have plenty to choose from and I just picked on that fit my needs. Figure out what you want to carry and pick one out. The wiring was dead simple. I'd never done this before and was apprehensive about doing it but I picked up a wiring kit at the local auto parts store for $25 and just followed the directions. It's really easy to do on the Elise since all the wires as just hanging there and easy to get all. I've since done this same thing to my Jetta wagon and that was MUCH more of a PITA. The Elise was easy. I don't have the clam hinge. I've used the trailer to get to solo events about 5 times so far this year and it is super easy to use. It tows like it's not there and it's great having everything in one place once I get to the event. I used to stuff the car with crap and now 95% of the stuff is on the trailer and I don't need to load/unload the car. I highly recommend this if you need to get to events and carry tires and tools. Been using one of the originals since they first came out. Just re-did my trailer. I used to have the same box as shown, but this time I put a bigger box on it, and am very glad I did. I carry a craftsman racing jack, smallish battery hamerdrill, battery rachet, Some tools, an air station built from a battery charger and a truck tire pumping unit (overbuilt), helmet, duffle with rain gear etc, . It used to fill up but now it's spacious. At this point I'm not sure I want to fill it up the new one for fear of making the tongue weight too heavy for me to lift easily (it's like 75-80lbs now, "easy" is already debatable). How are you guys putting a floor/bottom on this Harbor Freight trailer? Last time I used pressure treated plywood, but I decided I wanted to simplify construction at the cost of a bit more $ and weight. Last time I did bolts through the bottom of the box but it was nigh unto impossible to tighten the bolt without help (I eventually managed it by wedging a screw in to keep the bolt from turning but that was hell). This time I bought 2x12 pressure treated lumber, and that allowed me to simply lag the box down with 5/16 lag bolts. Pressure treated wood is key if you are storing it outdoors. As for pics, I'll try to remember to take a pic next time I have it loaded up. One thing I notice about the picture above is that the tires are only tied down with one strap, which is a single point of failure. The liability from tires bouncing down the highway behind you could get steep! Might be good to build in some redundancy. Both redundant systems should bear load equally during use, and both should be bearing the load "straight on" such that in the event of a failure of one the other will already be taut and prevent acceleration of the load. I like the idea of not having all my track gear in the passenger seat . With your explanation Dave, seems straight forward on connecting the trailer lights. Thanks to all for your perspectives. BOE, how much tongue weight can your bar handle? Exact tongue weight? I have no idea--- I'd say "adequate" and "use common sense". Over the years, we've seen people haul around anything from Thistle sail boats to luggage racks full back there. FWIW - I installed my bar and then as a test stood on the ball and bounced my 185 pounds up/down on it without issue. I just wanted to see if it could deal with that and it was fine. I have my trailer set up so that the tongue weight is about 30 pounds and it tows very well. My entire trailer and load is about 300 pounds and it all works very well. How has long term been on these guys? Did anyone come up with a solution to using the with 5 element diffusers? I towed my race motorcycle on harbor freight trailer....no issues! Get lots of look at the track when you show up though....but not as bad as when I use my mini cooper! Zero long term issues. Been towing the 2wheel 48" tires + tuffbox trailer since 2009 no issues. Probably ~250lbs trailer weight, tongue weight, is over 80 when the tongue it's on the ground, but probably under 50 when hooked up. I too have conducted the step/bounce test though not aggressively. Actually... I'm on my second trailer, but still on original hitch and elise. AMNE once claimed that the "bolts were frozen" to justify extra labor costs... the same bolts that I take out and put back in EVERY race with my battery powered rachet... (like 20 times a year). Last edited by fsparv; 06-14-2016 at 09:14 AM. 2) Extended diffusors such as difflow? Just wondering if it's an either/or if I wanted to add a tow bar. We need another run of these!!!! Race seasons coming! These tow bars are awesome, you can even pull smaller vehicles! @andy1 looks like you've got the two bar AND a difflow diffuser? Do tell! I thought those were mutually exclusive due to how the tow bars would have to mount under the diffuser. Absolutely stunning bit of kit (apart for the drilling bit that is). I wish a fabricator would make a similar one (but without any drilling required) to fit a boxster so I could carry my bike instead of having to drive the truck. You lot are really lucky to have someone able and inclined to produce and sell quality custom parts. You could fit a roof/bike rack to the 986 boxster and the 987 cayman using oem accessories, any other boxster/cayman is a no go, Porsche really screwed up, talk about progress. While it would make sense to me for 3rd party parts to be available to cater for this I have found nothing that is usable without leaving a mark. The closest I could find to meet my requirements is this BOE Tow Bar 2.0 creation, too bad it is for the wrong car and requires drilling! (already mentioned twice). I am sure for an extensively modified track weapon this is no issue. Anyway if you know of any fabricator in the states or europe that would be able to produce a removable hitch for a 987.2 boxster without any modifications to car and be able to bear the weight of a 1up rack and two bikes (I will also settle for one bike let me know! Just a heads up, we made another batch of these labor intensive little guys. Probably one of the most enjoyable and obscure additions you can make to the "Elige". 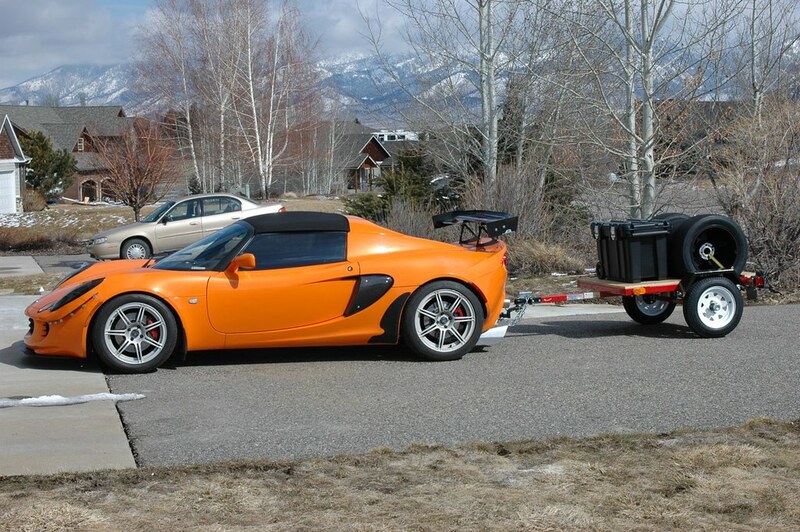 We have many, many dozens of these around the world pulling their track or camping trailers, thistle sail boats, etc. They really are quite neat and very functional. Sweet! This solves me having to load up the passenger seat. The link takes you to the BOE site but there is no details on the installation. The website shows it mounted with a Difflow diffuser, so that answers one of my questions. How easy is it to remove after you get to the track? Or can you leave it on without hurting air flow too much?